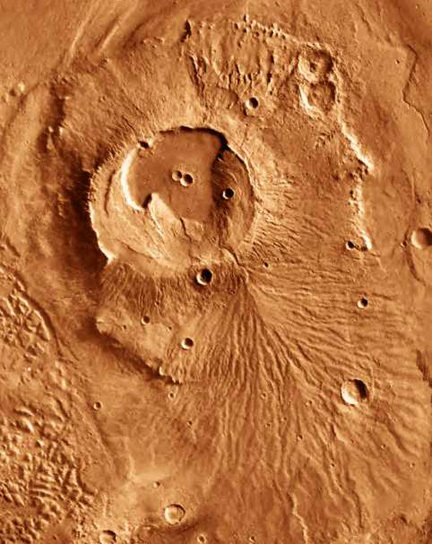 It turns out that the largest volcanic structure on Mars is not the shield volcano. Instead, it is an area of very low profile, but with a large caldera, called Alba Patera. 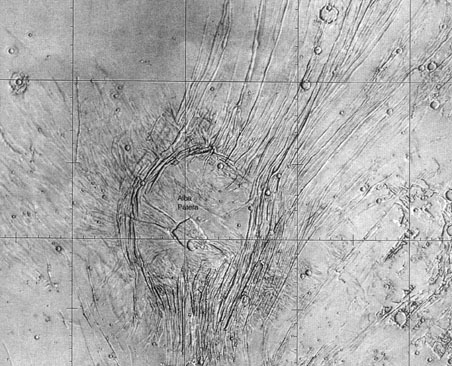 It is located in the Tharsis region just northeast to the Olympus Mons (Figure 6.12) . It is over 1500 km in diameter. The central portion of the structure is surrounded by a circular pattern of fractures. It was probably formed by a series of complex volcanic and tectonic processes. This kind of structure is unique on Mars and has not been observed on any other planet. Paterae can also be found in the southern highlands. Figure 6.13 is a view of an ancient volcano named Apollinaris Patera. Notice the relatively flat, pancake-like construct. Another patera volcano in the southern highland is named Tyrrhena Patera (Figure 6.14) . It is an old volcano and is extremely degraded. This frame is about 300 km across. Based on crater count, Tyrrhena Patera is estimated to be at least 3 billion years old. It also implies that volcanism may be a process that has existed throughout most of the Martian history. Many of the early eruptions might have been explosive events because of the possible existence of water (either in liquid or solid forms) near the surface.